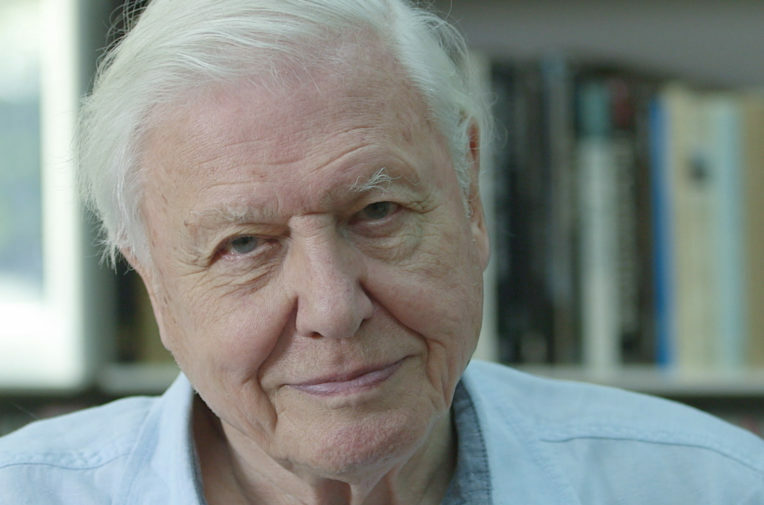 "All we have to do is keep declaring the facts as we see the facts, and producing the evidence whenever we can"
Damian Kahya interviews Sir David Attenborough at his home in London. Video: shot by Tom Pursey, edited by Fionn McSherry and Georgie Johnson, produced by Georgie Johnson. Words: Emma Howard. Sir David Attenborough may be 91, but he is a busy 91. As we set up in his Richmond home, he is upstairs studying footage of orcas and humpback whales on a herring hunt. He has just come back from Edinburgh. And last night he was up late writing the latest programme for his new series: Blue Planet Two. Sixteen years on from the first Blue Planet series, Attenborough is both delighted and saddened by his return to the oceans. The programme he has been writing is about how the oceans are changing. One change he has noticed is the plastic. Lots of it. There’s a shot of the young being fed, and what comes out of the beak of the adult? Plastic. It’s heart-breaking. It’s a topic Attenborough was keen to return to at the documentary’s premiere in London on Wednesday. The prequel is out now – with a soundtrack from Hans Zimmer and Radiohead. The naturalist used the opportunity of the premiere to call for action. Asked what concerned him the most with regard to the health of the oceans, Attenborough chose to highlight two challenges: climate change and plastic pollution. He said: “We could actually do something about plastics right now….internationally, tomorrow. I just wish we would…. The series, which has been four years in the making, visits every continent and ocean. It promises new filming techniques, from probe cameras that can capture life in miniature to suction cameras that sit on the backs of sharks. 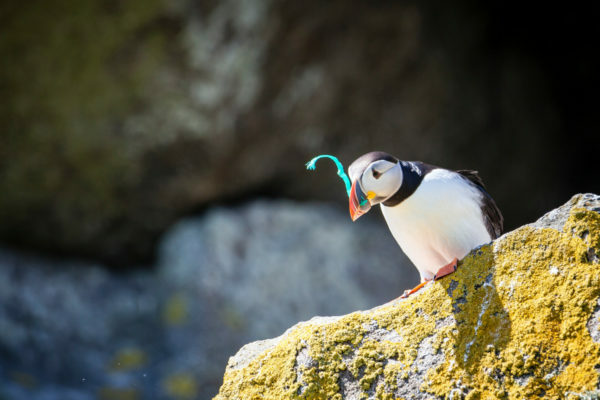 On the Shiants Isles in Scotland, a puffin holds a piece of plastic netting in its beak. Photo: Will Rose / Greenpeace. So despite the technological advances, storytelling for the world’s most famous naturalist seems as straightforward as it ever was. (His opening gambit entails extolling the characteristics of the “extraordinary” common slug.) Technology may change, but what interests people does not. But while Attenborough is a storyteller, he is also a scientist. You can tell because of the caveats. Yes he has seen climate change, but he is reluctant to pinpoint it. Where has he seen it most powerfully, we ask? He folds his arms, looks down and takes several breaths. What then, does the scientist, broadcaster and ex-BBC controller make of the political events of the last year? What do “alternative facts” and climate denial mean for truth-telling about climate change? Attenborough clearly wants to shy away from anything political – as he told Louis Theroux, it is easy to be a national treasure if you keep any controversial views to yourself. But when we come onto the subject of Brexit, he can’t quite help himself. He stares and there is a long pause. It’s hard to know what to say after that. Later when we return to the topic, he is more specific. “The decision to call a referendum was an abrogation of parliamentary democracy in my view because we didn’t know the facts. We weren’t presented with the facts. I still don’t know the facts really! All I know is that compared with when the referendum came, I realised it is much more complicated than i thought. Finally, he catches himself. He looks around, shifts in his seat and folds his arms. (He doesn’t know what Brexit means for bugs, if you were wondering). But when Attenborough considers the rise of fake news as a journalist, he is much more sure footed. Thirty years ago people concerned with atmospheric pollution were voices crying in the wilderness. We aren’t voices crying in the wilderness now. And yet, he has hope – although it’s decidedly cautious hope. “My hope is that the world is coming to its senses…I’m so old i remember a time when…we didn’t talk about climate change, we talked about animals and species extermination.